Making your models truescale is a task not lightly taken. Lots of us would love to try it out, but the work involved can quickly become overwhelming. Truescale models are not something we see very often either. Kinda like Space Marines are to your average Imperial citizen in 40k universe. They are part myth, part curiosity and you might go your whole life and never see a real one. I've never seen a real truescale model until recently. I'm not talking about pictures online either. In that case, we've all seen them I'm sure. I'm talking about real life models. I've always thought it would be cool to make my Terminators truescale. As soon as the reality of the amount of work involved set in, I quickly abandoned the idea. And it's not just the troops either... once you scale them up, suddenly your tanks seem a bit too small and your dreadnoughts are no longer those huge, hulking machines they were before. Then everything needs to be super-sized. I know the terminators are kinda squat in their stature. I'm keeping this discussion limited to terminators since that's what makes up my army and it's the only experience I have right now. I don't have any power armoured troops. I know everything is not to scale already, but once you start down this road, you need to be willing to make adjustments across the board so everything "fits." And that's the work. So I went looking to see just how a person would fit in a suit of terminator armour. Now I know I'm not the first person to do this and lots of folks will tell you that Marines are X feet tall and so on with all kinds of crazy stats and measurements, but I wanted to see if a normal proportioned person would fit in the armour. You can always make them "bigger" with more muscles, but I figure the proportions would remain the same. 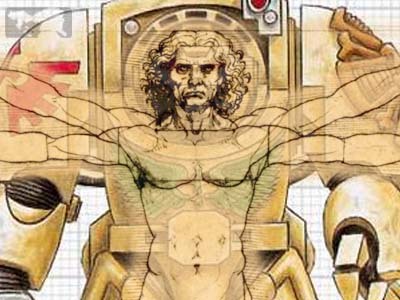 Being the computer wizard I am, I took Leonardo Da Vinci's human body proportion drawing and superimposed it over a Forge World drawn terminator suit. You can see how scientific this is and that I take this very seriously leaving no room for error. After some fiddling around with the armour, I found out I really only needed to do one thing to make the biggest change. That one thing was to increase the height of the torso by about one head. Not even one head really, maybe 3/4 of a head in terms of height. Now that's not the only "problem" with terminator armour. Some folks complain about the leg armour and it's lack of bulkiness. I'm sure there are other things too if you really get into it. But here's the thing. It comes down to what you think looks cool. This is perhaps the biggest conclusion I came to with all the looking around I did... it comes down to what you think looks cool no matter what the scale. I went thumbing through an old issue of White Dwarf and found this small conversion tucked in the bottom of a page that showcased the new plastic terminators (many moons ago). All he did was extend the abdomen of the model slightly. By about one head it seems. You can really tell on the painted model that he added the abdominal armour in there. I like this minor conversion. I think that little bit of extra height just makes the model look "right" to me. I can let the other things go as they don't really bother me that much. Except for the arms. Those bother me. In terminator armour, they come out of the side of a marine's head... way above where his shoulders would be. But I can fix that too. No big deal. I don't know of too many compaines out there making truescale bits. Most of the work these days is done by artists converting each model by hand out of other bits and extensive greenstuff work. Now there are more companies getting in on this whole truescale notion as of late with some bits here and there you can add to a regular boxed sets of marines. I'm going to be looking at one of the terminator truescale conversion kits out there by Three Stage Studios. I picked one up to see just how well they accomplished the truescale task and more importantly, how easy it was to work with. I know trying to convert a squad by yourself is a tremendous amount of work and sculpting. The next option is to get someone else to do it for you which can cost a huge sum of money as well. Barring those two options, it's buying bits that "up-scale" your models and adding all the little extras to them yourself. I've got my truescale model built now. As soon as I get him painted, we'll do a little comparison of the two sizes in the next post to see how well the model comes out. Next we look at the Three Stage Studio truescale terminator armour. Side note: Since I started putting this post together, it's grown from one post to a series of three or four depending on how much information I end up including. I won't dump all of them on you guys at once, so I plan on posting one of them each week until I cover it all or you guys revolt. Whichever comes first. That Librarian looks like he had his augmetics enhanced with Faux painting just like you decribed in your guide too. As to truscale, don't folk say it's primarily the human figures that are too big, hence making people want to enhanc the astartes to compensate. Maybe folks should 'downscale the oomies'? Great idea for a series of posts, Ron! Still looking forward to seeing your results! I've never tried this, but I have a spare squad of terminators sat around and some spare time tonight, so it could just be conversion time! I'm looking forward to how you'll sort out the 'Arms out of the side of the head' issue and keep the terminators looking at iconic as they always have. Good set of articles coming up I feel! The best use of Truescale marines is probably for games of Death Watch or Inquisitor. Another option is if you're only including a squad or so of Space Marines in an IG army via the allies rule, it would be sweet to have the Marines towering over your puny guardsmen. I made an "Art scale" space marine months ago to celebrate the release of the Space Marine video game. I think terminator armor looks good already. My plan for giving my models some scale is by putting the more important (like ICs and characters) and bigger models on higher bases. They stand higher and look more imposing and I don't have to do a lot of conversion work. Great work on studying this topic! Personally I always wondered why Terminators looked so goofy to me, and I couldn't put my finger on it until I read this article. It's the head! Terminators look like hunchbacks with inhumanly wide-set shoulders. You (Ron) mentioned the fix for the head, so I will definitely be keeping track of this project to see what comes up! I'll email you a few pics later on if you'd like of both the marines and the terminator.. I have tried truescale on normal marines, without the common job of terminator legs on normal bodies. its a lot of work but the end result looks amazing. but the time it takes is just too prohibitive, i lost intrest by the time i was half way through a squad. terminators however are pretty easy to scale up so they appear more in scale with normal unaltered marines. this allows you to lower the position of the arms so they dont look like they have no necks. i actually found the tartaros terminators to be more in scale with marines and anatomics in the general skewed physics of 40k than the plastic termies, despite the smaller overall size. The problem of True Scale is not the Marines, well, they are a bit on the cartoony proportion side but that's part of their charisma. The problem is the regular human guys, or the not-so regular human guys e.g. Catachans. It's not only something from the models themselves. I remember people arguing about the scale in books and how weapons and people change their size from book to book. Obviously being a goblin doesn't help because then everyone's towering over you. Always. Hi guys, first time commenting. I'm from Singapore and totally into the whole truescale thing. From my standpoint I think it's not just the astartes that require proportion adjustments. I've worked on a couple of I.G troops, some loyalist in PA and TDA. it's agreeable that the process of truescaling is indeed a time consuming process and to those who find it so, will soon find themselves giving up as I did once before. Back on topic, I find the humans need on average a 1-3mm height increase in their lower limbs. (I don't know if or how I can show my works on here, as Ron has been my inspiration on so many fronts.) My astartes and humans would be totally unplayable I think. It makes the vehicles and even terrain null and void but I think that's the joy of conversions. I took inspiration also from Lamenter, Doghouse and Tsuro from the forums, bastardised them and came up with my own concepts. Astartes are 8 feet in PA,7'6" out of in my opinion, so bulking them up massively, lengthening limbs and making them look like imposing superhuman beings would be my goal. Given their nature I beleive using Da Vinci's model would be a bit of a hit and miss, taking their genetic modification and extra organs. Long story short, my marines stand close to 55- 60mm. Above my upscaled humans, still they tower. Clarence here by the way. Pleasure to talk to y'all! So rivalling on 60mm tall are you following the sort of "Synapse" style truescaling (starting off with terminators with added plasticard extending in limbs) or going the doghouse approach of bulking up/neatening terminators with normal termy arms etc being used for limbs? As a general rule I grab a running cadian Guardsman and use one of those as my "Control" model, as eldar are allowed to be taller (and skinnier), while orks boys probably should be a tad larger, and gants/gaunts and espcially rippers need to be shrunk down a notch or two.. I'm quite liking all the different opinions/methods of truescaling..
Hi Nick, I started out with power armored marines, what I did was spaced out the PA chassis thickness-wise,then width-wise. (1mm each). The abdomen is to be spaced out 3mm, followed by using terminator legs, snipped for 2mm in the upper thigh, 1mm in the shins, followed by 1mm undersole. I usually sculpt over the armor ago make it slightly thicker if need be. 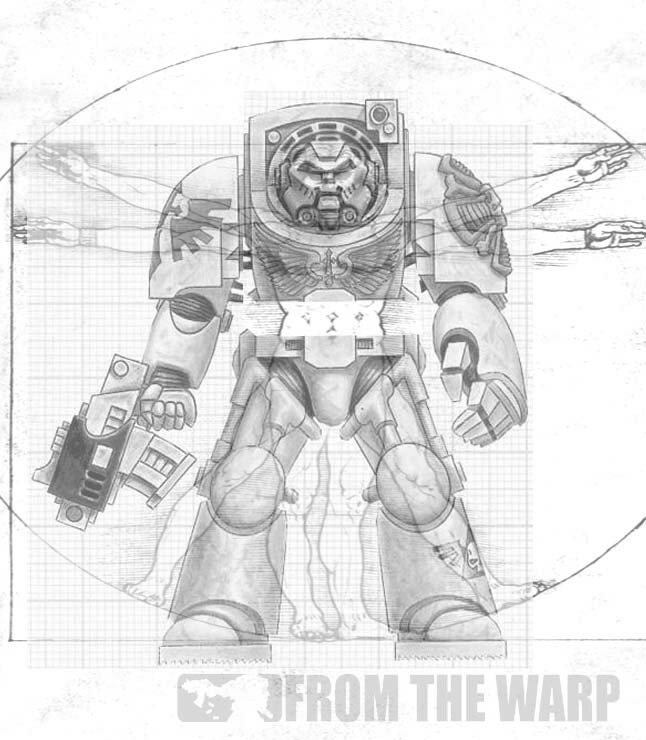 For TDA the approach is almost the same except I'd space the armor up to 4mm apart and 2mm width-wise. The legs benefit from an additional 2-3mm increase to the abovementioned method. Apologies if it's hard to visualise, I'm not a very descriptive writer. Concept-wise my TDA marines look helluva bulky. I mean if they can survive a titan stomp, stay safe in sun-temperatured plasma cores, are nigh invulnerable blah blah overpowered OTT attributes in my minds eye their armor had better be substantially thicker and bulkier. By the way, my Abaddon stands almost a head taller than Belial. I should also add that as my 'distraction' models I've worked on orks and eldar. My warboss absolutely towers over humans, much less marines. Give and take he's bordering on 65, 70mm. Given the whole bigger waaaagh means bigger size rationale. I like where this is headed, can't wait to see the complete series.. Very cool to see all the feedback here. I appreciate everyone's input on this topic. KrautScientist: It's true, the extra elements do help hide some of the issues that come up with this kind of thing. Gonders: it's a quick fix and I think it helps give them a more "normal" look like power armoured marines have. Nick: I'd love to see the temie pics you have! cpt codpiece: Interesting you mention using the FW termie legs on regular ones. I like that idea. ScottiJT: Not everyone gets into truescale so I have to space them out between other stuff. I definately didn't go all out on my guys but I did add a 2mm spacer to the waist and the feet of my models to give them added height. It wasn't as labour intensive as some of the other stuff out there since it didn't involve sculpting. It's not as cool and less drastic but it still shows on the table top when they're placed beside other marines or guardsmen for example (4mm is a decent amount on 28mm models). I also added about a 1/2 inch to my dreadnought and make a landraider from a baneblade. Most of these conversions are pretty straight forward and don't involve a ton of work to achieve a different/unique look. You might want to look at this thread dealing with Three Stage Studios. Anon: Very interesting stuff there. I can't comment on others experiences with Three Stage Studios or the validity of everything said there, I can only offer my personal opinion of the products they make. I'll be posting my own opinion in my next post (as far as it relates to the hobby aspect) but I hate to see things like this come up about the hobby. Nobody wins. Gothmog: Very true. With almost everything else as well, it comes down to what you like best and the "look" you prefer. @Anon - I have never had any problems with Three Stage. The link you posted looks like people say hes someone he is not. Classic interweb trolling to me. Good to see TheTrans imparting his wisdom here. 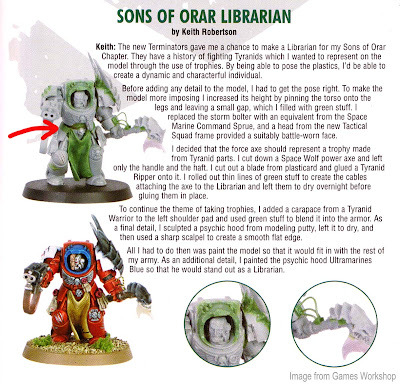 I have seen his work first hand (as they maul their way through my orks), and his results have been amazing so. Anon: There are apparently strong arguments from both sides. As I do not want to get involved in a "he said, she said" type argument over the particulars of the case, I'll keep my involvement to a review of the product itself. That was my commitment in the beginning. As with all things, when dealing with any online company that you do not know personally, it's worth your time to investigate all aspects of the company you are dealing with. If for no other reason than an informed buyer is a smart buyer. curnow: Very nice! That's a tremendous amount of work into one model. Not sure if anyone is aware, but there appears to be a lot of fraudulent activity regarding three stage studios... I'll let you decide, but please be aware..
Jaegerwulfen: Interesting, you are not the first person to share the link to that particular thread about Three Stage Studios. Like I mentioned before, I'm keeping my involvement to a review of the particular product itself. As with all things, when dealing with any online company that you do not know personally, it's worth your time to investigate all aspects of the company you are dealing with. If for no other reason than an informed buyer is a smart buyer. I hate to see things like this come up about any company since it does no good for any of us. Just reiterating what Jaegerwulfen mentioned, be very careful dealing with TSS. As for the truescaling the best I've found are Doghouse's or Apologist's Praetors of Calth, I've been doing it a bit with my Imperial Fists, and once you've got a couple built up properly it's hard to go back, standard marines just don't do it anymore. When I think of a space marine I think of a giant, built like a brick you know what, kitted out to basically make them a walking tank that can shrug of pretty much anything. Terminator legs, arms, with a GSed standard marine body look excellent imo. Just expensive. For a 'truescaled' dreadnought I've added another joint in the legs, arms and currently bulking up the body a little bit - they're meant to be around 15-18 feet tall in the fluff. Adding the extra joint also makes them look like they can walk because the standard sculpt is soo static. Anon: Thanks. Those examples you have for truescaling are very nice as well. Superimposing the termie on the DaVinci figure was a great way to illustrate that the proportional issues are really quite mild. Spacing in the midriff and the quad are all the marines really need to get them looking right. The superimposed image was exhibiting good posture and wasn't "dynamically" writing off his ankles. Nice insights and article glad \i was able to find and read it. Anon: Thanks. I thought the comparison would help make the point. Truescaling can create as many issues as it solves sometimes, but I think I've found a solution that works for me and results in a look that I imagine in my head they should be. Ultimately, it comes down to getting your models to look the way you want them t look no matter what others tell you needs to be done to them. Hopefully something in this post helps you out in that respect.